Hey! My name is Abigail Clone and I’m so happy to get to share a Bible Page process today! If you are new to Bible Journaling, my favorite way of describing it is art worship in your Bible. Shanna Noel, who is the fouder of Illustrated Faith started this idea a few years back and it has since grown into this amazing community! We use a whole bunch of different art and scrapbooking supplies to study the word in a visual way. A lot of Bible Journalers out there do it directly in a Bible that has margins on the side; but if you aren’t comfortable with that, grab a blank journal or sketchbook and you can totally do it in there! There are a ton of great products out there to get started and Faber Castell has a great starter kit! It includes pens that don’t bleed through the pages, stencils, die cuts, and so much more, so if you are just starting, this is a great thing to pick up! Today, I created a page with a little sunset polaroid picture I took while I was in Florida earlier this summer. The verse I picked was, Psalm 113:3. Everytime I look at a sunset I can just see God painting it with His big paint brushes, and what a great verse to remind us to always praise Him for His greatness! I started out with using gelatos and a stencil for my background just to have some fun pattern. The color I used for this was, Guava. It is such a pretty pink color and accented the picture well. To get that light color I first dipped a sponge in water. I didn’t get it too wet, just enough to dampen the tip. I then rubbed the damp sponge on the tip of the Gelatos. You have to push a little hard to get color to transfer, and you won’t get a lot on there so repeat when you need more color. I took another Gelatos, this one is the color Butter Cream, and made art marks around the page. I love having clusters of elements on my page so that the eye travels around it. Another tip is to do these in odd numbers so that it looks balanced. The next step is to take the sponge and dab it over the stencil so the color transfers to the page. If your stencil keeps moving, lightly tape it down with some washi tape so you can peel it up later without tearing your page. Take the stencil off and your beautiful design is revealed! After making art marks, I added a light grey splatter to the background as well. I took the Earl Grey gelato and my palette knife to cut the tip off the gelato. I added some water to the tip and stirred it around with my paintbrush until the chunks were dissolved. I used the stipple brush to splatter the paint and it just added a really light detail to the page. I added a few small elements to the top of my picture to add a little bit of detail. I took some stickers and a tiny paper clip I had on hand and clustered them together. To get the cool sun in the corner, I took one of the die cut cards that came in the Bible Journaling kit by Faber Castell and cut it out. I glued it down and layered one of the rays on top of the polaroid. I also added a few stickers on the bottom of the polaroid so I could write the date when it was taken. Highlighting the verse I am focusing on is probably one of my favorite parts to creating a page. I love using either Faber Castell’s big brush pens or just the brush pitt pens and then putting a box around it with some doodles. The last finishing touch was a tab at the top and this page is finished! I loved how it turned out and the colors matched so well with the picture. I hope this has inspired you to get into your Bible and praise God for His greatness! Scissors, Instax polaroid printer, Faber Castell Bible Journaling Kits (die cuts), Faber Castell Mixed Media Mandala Stencils, Faber Castell Guava Gelatos, Faber Castell Butter Cream Gelatos, Faber Castell Earl Grey Gelatos, Faber Castell Black Pitt Artist Pen (superfine nib), Faber Castell Green Gold Pitt Artist Pen (Brush), Felicity Jane Small Paper Clips, Faber Castell Stipple Brush from The Gelatos Artist Tool Set, and Illustrated Faith All People All Nations Sticker Sheet. Store your mementos in this nifty DIY box! Measure the paper/s you will use on the box and cut it so that it fits the box perfectly. Using the Gelatos, apply color on your watercolor paper. The Gelatos blend well, so using your paint brush, spread the colors to create gradients. Design the box to your tastes and add the ephemera and paper sheets accordingly. Coat the whole box with clear glue and let dry overnight. Store your tickets/ ephemeras inside. Hey everyone! It’s Erin from @the.lettering.fern and I am here to talk about the basics of lettering. I am going to break down all the basic strokes for you. These strokes are what you would call the outline, or the basic “rules” of lettering. I say “rules” in parenthesis because once you develop some muscle memory you are going to want to break the rules to start developing your own style! Let’s get to it. To start I used a Faber-Castell Pitt Artist Pen with a brush tip. You can tell the difference between the brush tip and the monoline tip by the letter on the cap and at the end of the pen. The brush tip will have a B and the monoline tip will have a letter that corresponds to the size of the pen, example S= 0.3mm. Before we even talk about strokes, I am going to give you a quick anatomy lesson of line spacing. There are basically 4 lines you want to keep in mind. The very top line is the ascender. This is where all the tall letters like to hang out like h, l, k, t, the tops of these letters will touch this line. The next line is called the waist. Think about your waist is in the middle of your body and this is the middle line. Most of the basic strokes will hang out in this area (along with letters like m, n, e, r, s). Next you have the baseline, all letters will touch this line. The letters that have a tail like g, j, and p will go below to the very bottom line called the descender. Now, let’s talk about the first two strokes: the upstroke and the downstroke. This is where you get the pressure of lettering into your muscle memory. One of the most important things to remember to get the different weighted lines is thin/light upstrokes and thick/hard downstrokes. When you are doing an upstroke you will start at the bottom of your line, the baseline. Then using the tip of your pen draw a light thin line to the waist. When you are doing a downstroke it is the opposite. Start at the waist, pushing with a pressure you are comfortable with, draw a slight S shape. For the downstrokes I have found holding my pen at about a 45 degree angle helps. Practice these about a billion times (you think I am kidding but the more you practice the happier your hand will be). The next strokes are the overturn and underturn. The under turn looks just like a U and the overturn is, well, just an upside down U. These strokes help you combine your upstrokes and downstrokes in a fluid way. To form the overturn stroke start at the baseline and work your way up to the waist with a thin upstroke but as you approach the top slightly curve, follow an arch shape, and head back down to the baseline with your thicker (more pressurized) downstroke. The underturn is the exact opposite. This time start at the was it with a thick downstroke and as you approach the baseline start that curve into an upside down arch shape and head back up to the waistline just like you are making the letter U. Remember as you are headed back up to the waistline it should be a thin upstroke. Lettters you will need this stroke for: m, n, y, u. After you have practiced the overturn and underturn a million times you can combine them into a compound curve. For the compound curve you start with the overturn but when you are finished you immediately head into the underturn stroke. This is a fun one to practice because you really develop your muscle memory of the pressure you need to get the ups and downs. Always remember up is thin, down is thick. Letters you will need this stroke for: h, v, x. The next stroke is called the oval, well, because it looks like an oval. This stroke will come in handy for letters like a, q, o, g, even c if you can believe it. This stroke is also kind go tricky because you are going to want to start at the waist line and you really need to be starting half way in between the waist and baseline. You are going to start with a small upstroke, arch around on the waistline into a thick downstroke, arch around again on the baseline into a thin upstroke to finish off the oval. Starting in the middle of the two lines helps to give the oval a more rounded look. Letters you will need this stroke for: g, d, p, b, q. The last two strokes include loops. Yes, I said loops. There will be a descending loop and an ascending loop. Do you remember the anatomy of the lines earlier? Then you guessed it! The descending loop will stretch down to the descending line and the ascending loop up to the ascending line. Let’s break down these strokes starting with the descending stroke. You will start this stroke at the waistline, do a thick downstroke to the descending line and then curve back up with a thin upstroke and connect the loop at the baseline. The ascending loop will start at the waistline, do a thin upstroke to start the loop, once you get to the ascending line curve back down into a thick downstroke all the way down to the baseline (make sure your starting point connects the loop to the downstroke). Letters you will need these strokes for: f, h, k, j, g.
And that’s a wrap! You know are in the loop on the basics of lettering. I have also included a short (but real time) video of myself writing out each of these strokes. Remember these things: don’t get frustrated if your hand isn’t doing what you want it to do right away, build up that muscle memory with practice, thin=upstroke, thick=downstroke, and have fun! Erin O’Brien Dahlberg is a Born and raised Utah girl. She graduated from the University of Utah with a bachelors degree in Education and has spent the last 4 years as a second grade teacher! She took a few art classes in high school and college. She loves to try and inspire creativity in her students everyday! Because she’s busy during the day, the night is when her creativity gets to explode into the world through lettering and messing around with watercolors. Her biggest advice would be to not compare your art to other people’s art! Be uniquely you! Bullet Journaling 101 - Add Some Doodles! Step 1: Create a cute little doodle with clean lines. Step 2: Add a border/outline to your doodle using a thicker pen. Check out: Faber-Castell Mix & Match Essential Pitt Artist Pens Set! Nicole Barlettano is a seasoned designer and illustrator living in the tri-state area. She is a bullet journalist known as @plansthatblossom, a chronic doodlebug, and a lover of lists. Step 1: Begin by writing or drawing a letter or word. This can be your real handwriting, brush lettering, or even a doodle! Step 2: Add shadows to your letters by using either a light brush pen, a black outline, or you can even take it a step further by creating a 3D block shadow. Step 3: You can add highlights using a white pen, add details inside for texture, or layer brush pens to create an ombre effect! Check out: Faber-Castell Lettering Art Pitt Artist Pen Set! I've partnered with @fabercatellusa to bring you a few tutorials on how to add interest and dimension to your journal! With just a few tips and tricks, these tutorials can help bring your journaling to the next level! Let's start with a simple box! Step 1: Simply draw your shape with clean corners and straight lines. Step 3: Add depth by using a light brush marker along the bottom and right edges of your shapes. Check out: Faber-Castell Mix & Match Pitt Artist Pens Writing Set! Thank you so much for taking the time to check out my tutorials! The kit comes with excellent tips in the pamphlet included. To create this loose floral illustration- start by stenciling 2-3 flowers and layer beneath and around them with the leaves and vines. Leave a small space for some lettering if you wish to! Make sure to keep in mind what you want in the foreground (the flowers) and do not overlap the leaves and vines on top of those. The Pitt artist pen in XS included is wonderful because you can lay down your ink lines and they will not smudge or bleed when painting on top! I loved the palette color choices because the colors are already complementary! Experiment with varying light to dark shades on the same flower petals to add dimension and really make it pop. 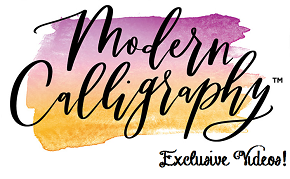 Try out lettering a short quote using a Pitt brush pen for a touch of modern calligraphy. Leah Kelly is a modern calligrapher in hand lettering artist. She is military wife who took up the hobby to create things for her own wedding. When she’s not addressing invitation envelopes or place cards, she loves to use calligraphy and painting as a creative form of meditation. Leah is currently working to get her professional certificate in graphic design.